When finishing your lower level, or in Minnesota as we call it a basement. There are many factors to consider in the design phase that may influence your budget. These areas may include a theater room, family room, game room, wet bar, bathroom, or a bedroom. In this blog, I am going to address these areas separately from the prospective of an interior designer, and your builder. Before we get into the different rooms, I am going to address the basic construction of a basement remodel and budgets. Framing; Framing is needed in almost all lower level remodeling. The extent of framing is determined case by case. Your walls need to or should be framed with 2x4 studs on the perimeter and interior walls. Based on the age of the home, the ceiling will need to be framed along with soffits around duct work, plumbing, and etc. Framing may seem to the average eye as easy, however, it is labor intensive. Framing is time intensive, what is most often overlooked is the time it takes to move the lumber from the front of the home to the basement. As a good rule of thumb, I plan on 2-2x4’s per liner foot of framing to be completed. Add the amount of lumber needed and think of the investment in terms of time to move the lumber to the basement. After the framing is complete, it is time to rough-in the space for Plumbing, Electrical, Heating and Air Conditioning (HVAC). The cost for these separately licensed contractors may have a wide range and will be directly affected by the scope of work, and the age of your home. Keep in mind, when completing a remodel, the work needs to be brought up to current building code. What should you budget for your basement finish? If you were to Google the cost to refinish a basement you would find many different answers in regard to the cost. Most, if not all, of the answers are not accurate. Most likely the cause for not budgeting enough is not accounting for an accurate scope of work. A good starting point for a basement finish is $35 a square foot. This is basic framing, insulation, electrical, HVAC, drywall, painting, and millwork. If you want to add a bathroom, or additional framing for multiple room, and layouts the cost may increase to $45 a square foot. As with all a generic numbers the cost per square foot will vary for each basement project. As we talk rooms for a basement remodel, I am going to base the cost off a 1500 square foot basement finish with a $45 a square foot cost to finish. Framing, plumbing, electrical, and HVAC are 4 of the 6 labor and material cost that are part of every basement finishing project. Number 5 is insulation. Insulation is a must, Now, you may be saying that the walls in your basement already have insulation. This insulation will most likely need to be removed to complete the necessary rough-ins of electrical, plumbing, HVAC, and framing. I am a firm believer that insulation should be removed for two reasons. First, it will cost more money to work around the existing insulation than it is to remove and replace. Second, if working around the exiting insulation it’s integrity will most likely be compromised and in the end and will not function as planned. When it comes to insulation, I believe the best option is spray foam for your basement. Especially with our Minnesota weather… the basement is almost always damp and colder than the upper level. You can always spend more in the long run by using the furnace more or a fireplace to keep the basement warm. But you will get more value for your dollar with spray foam insulation. Well, the good news is we are onto to drywall and painting. Drywall and painting are the final basic stages prior to seeing your and your designers hard work come to fruition. Drywall is not exciting, walls finished smooth, ceiling finished with a knockdown. Next, let’s go through the different rooms you may have in your basement. Family Room; the family room is created for almost all lower level finishes. A typical family room will have an entertainment center for the television, and low voltage components. A place for furniture, and fixtures. A family room is usually the minimalist when it comes to the design and scope of work. Theater room; in addition to the family room, a theater room is built to be dark, cozy and sound proofed, just like the same movie experience you get in a commercial movie theater without leaving your home. Along with the theater room, there are unlimited possibilities on what you and your interior designer can create. Things like a lobby and concession stand for the popcorn with all the toppings, beverages and candy. Adding a theater room can increase a basement budget by 30% when accounting for low voltage, soundproofing, electrical, seating, and media equipment. 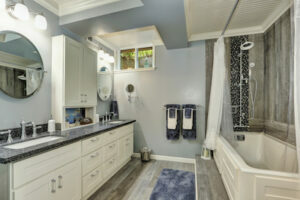 Bathroom; when comes to a basement bathroom you can choose from a ½ bathroom (toilet and sink), ¾ bath (shower, toilet, and sink), to a full bathroom (bathtub / shower combo, toilet, and sink). Based on the layout of your home, and the overall goal of the finished remodel it is an individual choice of what you choose. The budget to add a bathroom is staring at 25% of the overall cost. The final budget will be determined based on the size, layout, and plumbing access. Your options that will affect your budget and can range from a tiled shower, to a fiberglass shower surround, and tiled floor vs. a vinyl floor, vanity, countertop, and heated floors vs. non-heated floors will have a direct impact on your budget. Game Room: in most cases, remodels that include a game room does not affect the budget regarding to construction cost. The games you add can be arcade games, a pool table, shuffle board, to a ping pong table. Once again, what you add is based on your preferences. Wet Bar / Dry Bar; adding a dry bar will vary in cost based on design. The cost to add a dry bar is around 15% of your budget. This is mainly for the framing, cabinetry, and countertops. Adding a wet bar typically increase the cost by 25%, if access to plumbing is readily accessible and close. Bedroom; adding a bedroom to the basic budget includes framing, drywall, and usually a closet organizer and basic mechanicals. Expect your budget to increase by 8%. Exercise Room; your exercise room is the same in relation to budgets as a bedroom, about 8%. For the builder it is about finishing the space. For you it is about buying the needed equipment for your exercise room. Wine Cellar; do you like wine, perhaps a wine cellar to store your bottles is the ticket. 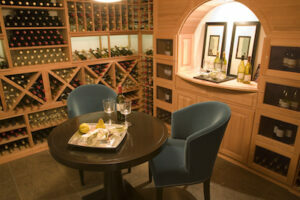 If you do not need a full wine cellar but are looking for a place to sit an enjoy a drink of your choice. An area to install some custom cabinetry for storage and display can be a great option for you. A full wine cellar can increase your budget by 25% to 50%. If you decide to go with some cabinetry for storage and display you might be around 15% of additional cost. Your interior designer can design the cabinetry, go shopping with you to select your furniture fort this sitting space. Well, this blog got a little long, and if you were doing the math going along the way it might have gotten overwhelming. My advice, when speaking from experience is start with your investment amount. 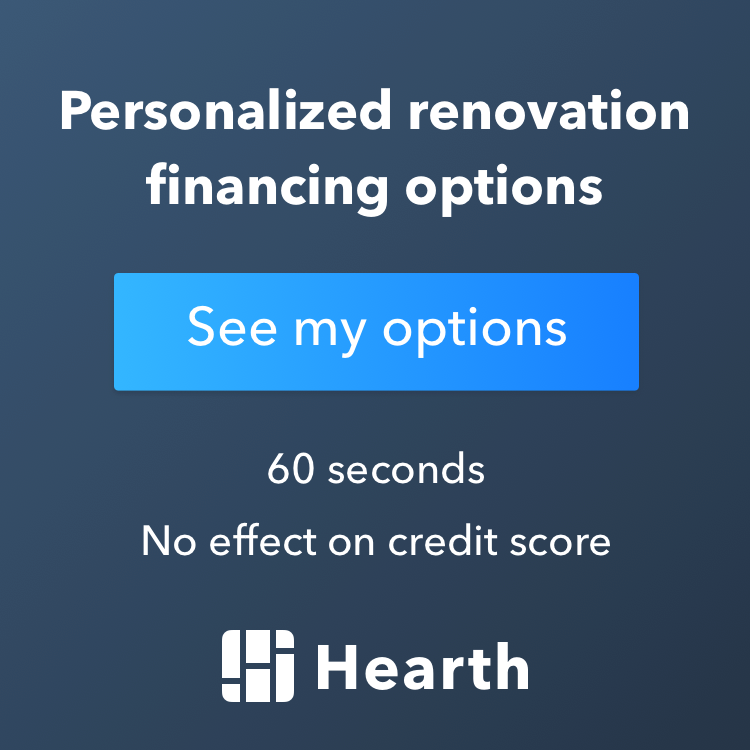 Your investment amount will determine if you can start your basement finish immediately, or if you need to secure additional funds. These funds might be saving more money or getting a construction loan to complete the remodel. After your budget is determined, then it is time to address your needs and wants. Needs and Wants: Needs and wants are a case by case basis. Be realistic with yourself on your needs and wants. Perhaps you need a bedroom for a growing family, this bedroom will require a bathroom. In my opinion that is a need, a bedroom and a bathroom. An example of a want might be, wanting a theater room or a game room that you would like as a space for your kids to play and entertain where you can’t really hear the noise upstairs. This would require additional cost, and possibly soundproofing. These are just some examples of the needs and wants. In the end, Excel Builders of MN will design your basement project to fit your needs and wants. As a design and build firm we work with our clients to design, price, and build custom remodeling projects. These projects are not limited to your basement, we complete kitchen remodels and bathroom remodels, whole home remodels, along with everything in between. 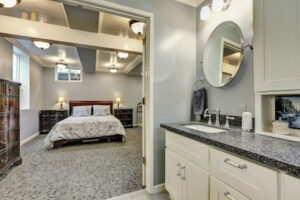 Give us a call at 612.524.5804 to get your remodeling dreams starts. We look forward to hearing from you and bringing you into being part of our family of great clients working with great people.